One of my personal issues with large group instruction is that I always find my self distracted from using technology. Have you ever sat in the back of a large lecture hall and used your phone for the majority of class? How about having a teacher that restricts technology use as a whole? Within the past several years there has been an extraordinary amount of research on the effects of using cell phones in schools. Studies have shown the schools with smartphone bans had student receive higher test scores. According to the study mentioned in this article, researchers found that amongst thousands of 16yr olds, schools that banned cellphones saw a 6% increase in their test scores. Even more impressive was that students that had been struggling, and the ban had been put into place during that time, their grades on exams improved up to 14%! Cellphones however are not just distracting those in high school. According to a study done by Dr. Chris Bjornsen, his results showed that for every time a college student checked his phone in his class, their test scores out of 100 on average would decrease by six tenths of a point. From his study he was also able to correlate social media usage in class to a student’s GPA. His findings suggest that students with a 3.0 or higher checked social media an average of 2.99 times a class, compared to students whose GPA below 2.0 checked sites such as Twitter and Facebook approximately 3.8 times a class. With all of this data supporting the the hypothesis that cellphone usage decreases grades, you may wonder why students still use their phones. According to this article 92% of students in college use their phones to send text messages during their classes. This data was concluded off of a study that surveyed a total of 269 students. All though their sample size compared to the entire college population is small, I’m sure similar results would be found elsewhere. Although cellphones in classrooms typically have a negative connotation, many teachers use them to engage the class in polls, and perhaps even message boards so students can ask questions without interrupting the class. In my personal experience, this has been very fun and provide a good change of pace to the typical lecture hall class. However, it also allows me to become easily distracted due to the fact that I have my cellphone out and teachers would lack the knowledge if I am using it for the purpose they intended or at my own digression. 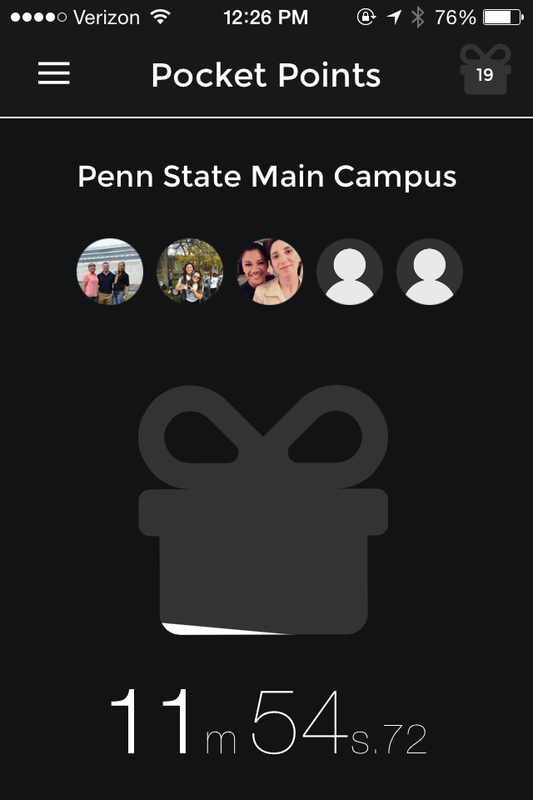 At Penn State and other schools across the nation an app called Pocket Points has been fighting the use of cellphones in class. 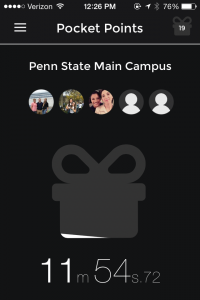 The incentive to using the app includes discounts at local stores and restaurants such as the student book store and Qdoba. The way the app w orks is that it recognizes where you are using your GPS location. When it realizes you are on campus you can open the app and then you lock your phone and put it away. The longer you phone is locked while the app is open, the more points you accumulate. With the points you earn you then redeem them at the stores downtown for your discounts. I would be interested in seeing more data and experiments done on not only the usage of cellphones but on other forms of technology such as tablets and laptops in classes and how student’s performances compare. This data could give teachers better insight on how to run their classes and how to get the best work out of their students. This entry was posted in Uncategorized on September 15, 2016 by Christopher Ronkainen. This is definitely a topic that needs to be up for discussion! Also thanks for the app info; I will definitely be looking into getting it now. In my personal experience, I have been the most focused in class by silencing my phone, locking it, and shoving it into the bottom of my backpack. I feel like this topic needs MUCH more research, especially since the study you reference used such a small sample size that wasn’t even a random sample. The only randomization that was used was in which major the study participant belonged to at the small college at which it took place. In terms of who cell phones are distracting, I feel like what we’ll find in other studies is that no matter what, a classroom allowing only pen and paper will yield more academically successful students. The use of cellphones in class was definitely a topic that needs to be spoken of. Technology has taking control of us and its as if we can’t go a day without using it. 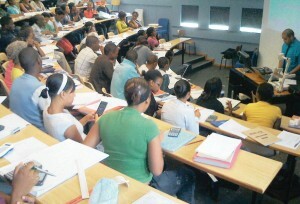 I agree that cellphones are being misused in classes and especially we see this in college lecture halls the most. We are too focused on whats going on outside of the lecture and in return we do see the decline in our grades because of this. Professors are giving us the freedom to have our phones in class but we take advantage of it to the max. If we were to focus we definitely would do way better on exams. I completely agree with you–I love the polls in class and find them engaging, but it also allows us to become distracted by notifications we would have otherwise ignored. For the first few weeks of school, I always put my phone in my backpack so I could pay attention, but this week I’ve found myself slacking off, which, in turn, has caused my notes to be more scattered and my attention span to be weaker. It’s fascinating, but also makes complete sense, that students who don’t use their phones see a rise in their GPA. I remember Andrew saying that even if we just check Twitter for a couple minutes in class it takes our brains even longer to “click” back into classroom mode and for us to pay attention like we had before we checked our phones. According to Medical Daily, students did better on tests if they couldn’t see their cell phones, such as if their cell phones were hidden away in their backpacks. (http://www.medicaldaily.com/out-sight-out-mind-cell-phones-may-diminish-cognitive-ability-even-without-use-313590) It could be worth a try! Here is an article that provides some more points about how cell phone use in class is bad. I love my phone as much as the next girl, but I think that technology is taking over the world. I know that technology can be good, but I think that for the most part we use it way too much when it’s not necessary. I like how you mentioned that even though we know it’s bad for our grades, we still do it and I agree with another comment when they said that is from habit. I often find myself reaching for my phone in class just because others around me are on their phone or just from habit. However, I just downloaded pocket points and hopefully I can learn to stay off my phone! Great post!! I agree that phones always seem to distract me in large classrooms. I like how you mentioned that even though we know it is bad for our education we still do it. I think that part may come from habit. Personally, sometimes I pick up my phone and check social media or text almost without even realizing it. I’ve had a phone since middle school so at this point using it doesn’t even cross my mind, it just happens. Maybe a good way to move forward would be to find ways that allow cell phone use to be beneficial. Of course cutting it away would be preferred but it is also semi-unrealistic, especially in large college lecture halls. I read this cool article that talks about how to use phones as a tool in the classroom and keep it appropriate.